"Apogee," "Perigee," "Aphelion," "Perihelion" redirect here. When an object (such as the Moon) orbits the Earth, the point along its path that is closest to Earth is called its perigee, and the point farthest from Earth is called its apogee. When a celestial object is in an elliptical orbit around another body, an apsis (plural apsides) is a point on the orbit at greatest or least distance from the center of attraction, which is generally the center of mass of the system. The point of closest approach is called the periapsis or pericenter, and the point of farthest excursion is called the apoapsis, apapsis, or apocenter. (In technical usage, the words periapsis and apoapsis are preferred over pericenter and apocenter.) A straight line drawn through the periapsis and apoapsis is called the line of apsides, corresponding to the major axis of the ellipse, that is, the line through the longest part of the ellipse. Derivative terms are used to identify the body being orbited. The most common are perigee and apogee, which refer to points on orbits around the Earth, and perihelion and aphelion, which refer to points on orbits around the Sun. The terms perihelion and aphelion are commonly used for orbits of planets in the Solar System, but the same terms are occasionally employed when referring to the nearest and farthest distances of a comet from the Sun. During the Apollo program, the terms pericynthion and apocynthion were used when referring to the spacecraft's orbit around the Moon. The term apsis is derived from the Latin word apsis, meaning "arch" or "vault," which can be traced back to the Greek word hapsis, meaning "loop" or "arch," from Greek haptein, meaning "fasten together." The prefixes peri and apo can be traced back to Greek terms that mean "near" and "away from," respectively. In the case of perigee and apogee, the root gee comes from the Greek gê, meaning "Earth." For perihelion and aphelion, the root helion is derived from the Greek helios, meaning "Sun." As noted above, "-gee" and "-helion" are used for orbits of objects around the Earth and the Sun, respectively. Various additional terms have been coined for orbits around other celestial objects. For example, "-astron" and "-galacticon" are used when the body being orbited is a star or a galaxy, respectively. For orbits around a black hole, physicist Geoffrey A. Landis introduced the terms perimelasma and apomelasma (from the Greek root) in 1998; but later (in 2002), the terms perinigricon and aponigricon (from the Latin) appeared in the scientific literature. Various terms are listed in the table below. Although some of them are used occasionally, the term -saturnium has rarely been used in the last 50 years. 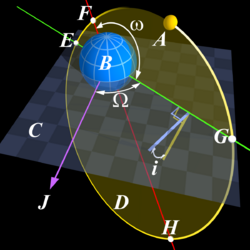 Also, the -gee form is commonly (albeit incorrectly) used as a generic term for "closest or farthest point from a planet," instead of specifically applying to orbits around the Earth. Given that "peri" and "apo" are derived from Greek, it is considered by some purists more correct to use the Greek form for the body, giving forms such as "-zene" for Jupiter and "-krone" for Saturn. The daunting prospect of having to maintain a different word for every orbitable body in the solar system (and beyond) is the main reason why the generic '-apsis' has become the almost universal norm. In the case of the Moon, in practice all three forms are used, albeit very infrequently. The "-cynthion" form is, according to some, reserved for artificial bodies, whereas others reserve "-lune" for an object launched from the Moon and "-cynthion" for an object launched from elsewhere. The "-cynthion" form was the version used in the Apollo Project, following a NASA decision in 1964. For Venus, the form "-cytherion" is derived from the commonly used adjective "cytherean;" the alternate form "-krition" (from Kritias, an older name for Aphrodite) has also been suggested. For Jupiter, the "-jove" form is occasionally used by astronomers whereas the "-zene" form is never used, like the other pure Greek forms ("-areion" (Mars), "-hermion" (Mercury), "-krone" (Saturn), "-uranion" (Uranus), "-poseidion" (Neptune) and "-hadion" (Pluto)). The Earth is closest to the Sun in early January and farthest in early July. The relation between perihelion, aphelion and the Earth's seasons changes over a 21,000 year cycle. This anomalistic precession contributes to periodic climate change (related to what are known as Milankovitch cycles). The day and hour of these events for recent and upcoming years are noted in the table below. A diagram of Keplerian orbital elements. F Periaps, H Apoapsis and the red line between them is the line of apsides. The geometric mean of the two limiting speeds is , the speed corresponding to a kinetic energy which, at any position of the orbit, added to the existing kinetic energy, would allow the orbiting body to escape (the square root of the product of the two speeds is the local escape velocity). ↑ Online Etymology Dictionary, Homepage. Retrieved November 14, 2008. ↑ Properly pronounced "affelion" because the (neo) Greek is αφήλιον, although the hypercorrection "ap-helion" is commonly heard. ↑ National Solar Observatgory, Apsis, Glossary of Terms. Retrieved November 14, 2008. ↑ U.S. Naval Observatory, Earth's Seasons: Equinoxes, Solstices, Perihelion, and Aphelion, 2000-2020, Astronomical Applications Department. Retrieved November 14, 2008. Bate, Roger R., Donald D. Mueller, and Jerry E. White. 1971. Fundamentals of Astrodynamics. New York: Dover Publications. ISBN 0486600610. Montenbruck, Oliver, and Gill Eberhard. 2000. Satellite Orbits: Models, Methods, and Applications. Berlin: Springer. ISBN 978-3540672807. Open University. 1990. Planetary Orbits. Mathematical Models and Methods, Unit 30. Milton Keynes, UK: Open University. ISBN 0749220368. Rees, Martin J. (ed.). 2008. Universe. New York, NY: DK. ISBN 978-0756636708. Seeds, Michael A. 2008. The Solar System, 6th ed. Belmont, CA: Thomson Brooks/Cole. ISBN 978-0495387879. Vallado, David Anthony, and Wayne D. McClain. 2001. Fundamentals of Astrodynamics and Applications. Space Technology Library, 12. Dordrecht, The Netherlands: Kluwer Academic Publishers. ISBN 1881883124. Dates and Times for Equinoxes, Solstices and Perihelion/Aphelion. The Weather Doctor's Diary. This page was last modified on 9 April 2016, at 16:30.